General Observations: Summer is here! Well, not quite, but it sure feels like it. Temperatures are on the rise and activities on the farm are in full swing. The chickens are on the move, construction on the high tunnel continue, a rainy second week provides a much-needed chance to catch up on some greenhouse and administrative tasks, and a big push for planting at the end of the month keeps things moving right along. Equipment (45 hrs. ): Case 265: 2; Kubota: 11; JD 2240: 14; Ford 4600: 8; IH 140: 7; Walking Mower: 1; Weedwacker: 2. There’s always somethin’ that needs fixin’! Mid month it was discovered that the JD 2240 battery was run down and perhaps may need to be replaced (again). A week later the recoil on the BCS wouldn’t catch; MR disassembled and found a loose screw (center screw that holds together the inner workings of the machine). Time was spent tightening things up and reassembling, but it seems some tension was lost and a rattle remains. Other equipment hours fall mostly into the category of field prep and general mowing / maintenance around the farmhouse yard, market garden, field beds, etc. Administration (41 hrs. ): The daily, weekly, bi-weekly grind of administrative duties continues (payroll, accounting, et cetera). Federal deposit for May filed early on in the month. Several big bills taken care of towards the end of the month, including insurance, liability and workers comp; approx. $5000 combined. Farmland Assessment paperwork and NOFA Mentor Progress report taken care of. Other administrative hours were spent discussing daily tasks, equipment diagnostics and repairs, introductions to planning & permits, the creation of a strawberry field along 579, and the potential of weekday markets in Woodbridge and here at NSF. Infrastructure (181.5 hrs. ): Moving day for the chickens! They are now in the 579 fields (6/16). Keeping up with general maintenance (mowing, weed whacking) is an ongoing task. More tomato stakes needed, crewmember sent to lumberyard on 6/9. 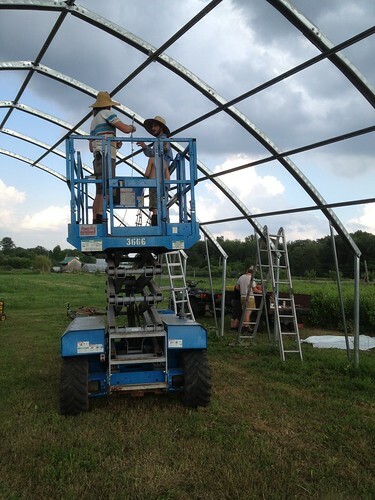 Work on the high tunnel continues (see special projects below). Greenhouse (57 hrs. ): The rainy second week of June provides a great opportunity to catch up on some greenhouse work. Tomatoes in Ralphs house are weeded, mulched & clipped. MR researches the double leader system – first sucker of the lowest fruit cluster becomes the second leader. In Farmhouse Gothic beds are prepped for artichokes, zinnias are staked and strung, edges weeded. End of the month greenhouse activity includes seeding several flats of arugula, basil and microgreens, potting on of tomatoes from 406s into cowpots, and seeding of the 4th vegetable succession. Composting (16.5 hrs. ): Prep begins for the 3rd vegetable succession: 10 field beds composted in Veg C North. Composted via spreader attached to IH140 (6/3). More composting in Veg B North (6/4). Three flowerbeds in 579 fields composted and broad-forked on 6/25. Planting (69 hrs. ): The week of 6/16 brings back sunny weather and drying conditions that allow for much needed catch up on planting that was delayed due to the previous week of rainy & stormy weather. Veg C North veggie succession (3rd) planted on 6/17, followed by 2 beds of field salad in NW BGBs (6/18). On the 25th planting of beans and squash in Veg C North was started but interrupted by rain and soggy conditions. The task was finished later in the week. Crop Care (197.5 hrs. ): The battle with the weeds continues! Lots of scuffle hoeing and hand weeding this month. Field tomatoes staked and mulched on the 10th. Tomato clipping continues in Ralphs House as the plants grow taller. Crew finds an unwanted visitor munching in Veg C North on the 27th. The small groundhog is captured but is quickly released after attempting to munch on his captor! Harvesting (260.5 hrs. ): Weekly harvesting for markets. First flowers are harvested from the hoop house on the 6th. Three trays of delicious strawberries harvested on the 10th. Mid month brings the first harvests of garlic scapes and broccoli. End of the month harvest on the 25th yields one brown crate full of yummy summer squash! MR cut hay in Veg D on 6/7. Thick vetch growth binding up the rake proves to be an added challenge. The last spring baling of cover crop & Veg D yields about 200 bales. Chances were taken and hay collected was left uncovered (no cover was easily available) in hopes that forecasted thunderstorms would hold off. But the rains came and the bales now usable as mulch or compost material. Lesson: when harvesting it is important to have a plan in mind in terms of preserving and protecting the crop (consider ahead of time what resources and facilities might be available). Handling (57 hrs. ): Weekly handling of greens and salad mix harvested for weekend markets. RM takes on first hardy greens handling on 6/5. TH on lettuce duty on the 6th: 81 lbs. of mixed salad, 6 worker hours. Crew takes note on the 19th that harvesting & handling rates need to increase. As flower harvesting continues, CH gives introduction to AM on handling and bunching practices here at NSF. Marketing (125.5 hrs. ): Weekend markets in West Windsor and Summit off to a great start this month (see market sales below). Incredible market day in Summit on 6/1! Sales compare to those in June 2013, even without mushroom sales. Twenty more lbs. of lettuce sold, egg sales up by 10 dozen. The next week however brings a significant drop in sales at both markets. Perhaps weather related? Lower harvest yields? Summit market sales back up at final June market, but WW sales remain low. Special Projects (12 hrs. ): High tunnel construction continues. In the first week of June the crew tackles adjustments to previously set posts in the NE and NW corners. JD 2240 used to pull posts out and they are reset. Fine gravel used as fill. The last three ribs are put up and two more rows of purlins completed on the 12th. A rented scissor lift is used to mount the purlins. Crew notes that the further away from the ridgeline, the more challenging the process. But by the end of they day a few tips and tricks made the process much easier! Week 1: Feels like summer! The month starts off sunny warm, with temperatures in the 80s. Mid-week rain showers with a total rainfall of 1”. Week 2: Rainy days with forecasts of thunderstorms. Week 3: After a rainy week the sun is back and conditions are drying (much needed for planting!). Week 4: Sunny & breezy, temperatures in the 80s with moderate humidity. General Observations: Despite a few challenges, including cold temperatures in the 40’s and low 50s, as well as a handful of equipment troubles & infrastructure adjustments, things here at North Slope are chugging along and another great season is beginning to unfold. Farmers markets are up and running, tomatoes and flowers are being planted in the field, and the greens are thriving! Equipment (59.5 hrs): Kubota: 12, JD2240: 10, Ford4600: 8.5, IH140: 12, Walking Mower: 6, BCS Rototiller: 2, Weed Wacker: 9. (5/5) Kubota mower readied for action: fluids checked, radiator screen cleaned and blades sharpened. (5/27) Crew ready for busy day pre thunderstorms but setback due to multiple equipment troubles. Flat tire on JDS loader, busted wrench while loosening bolts but repairs were finished. IH140 wouldn’t start, but with determination MR got it to start and worked on ripping furrows for tomato planting. Administration (35.5 hrs. ): (5/7) MR prepared reference documents to record setbacks from property line issues regarding high tunnels. (5/8) Final official review of Greenhouse introductions including physical descriptions & design of the structures, management processes like heating, circulation, ventilation, watering, checking thermostats, etc. Also discussed supplies needed for seeding, use of the watering wand and hose, germinating heat mats, tags, GH order forms, etc. Infrastructure (124 hrs): (5/1) Chickens in the mud from all the rain leading up to this first week of May. Coops moved within fence to nice grass. Lots of mowing and weed whacking to do around the farm as a result of a rainy spring. (5/5) General maintenance including mowing of 579 south field, farm perimeter and diversions, market garden, corner garden and roadside edges. (5/7) JT and MR cleared bushes from access lane along 579. (5/8) Box truck came back from full service – fluid checks & inspection. Test run for walk-in cooler yielded ‘No Shut Off’ & temperature dropped below 25 degrees. Had to use box truck as back up refrigeration. (5/25) Billy goat mower in farmhouse yard, front west of the farmhouse weed wacked. Lots of poison ivy discovered in the southeast corner; will have to be decked out in full armor to defend against ivy attack. (5/28) JT & RM made repairs to irrigation system (gauge and coupler) in flower field as well as repaired the main line in the tomato field. Greenhouse (165.5 hrs): (5/8) Full crew on seeding flats for market sales. (5/20) Crew potting on tomatoes, peppers and eggplants. Begun seeding 4-pack succession, nearly done at the end of the day. (5/23) JT and AM finished last seeding of tomatoes to 406s (for new high tunnel) and 4 packs for sales. Stringing and clipping tomatoes in Ralph’s house so as to maintain upright growth. (5/25) JT discovers that zinnias in NE corner of greenhouse were nommed on, potentially by rodents. Composting (58.5 hrs): Compost continually dug up and sifted for potting and seeding. Compost from big compost piled used on several occasions to prepare BGBs, field beds and corner garden beds. (5/7) MR loaded ATV wagon, JT, RM and AM composted 4 BGBs, 1 corner garden bed and 9 flower beds (1 load per bed). (5/20) Composted and broad forked BGB SW (3 beds) as well as BGB on North side of asparagus (2 beds). (5/27) Compost spread in flower field and furrows in preparation of tomato planting. Planting (233.5 hrs): (5/5) IH140 used to rip beds in 579 South (Flower) field. All 22 beds ready for compost! (5/7) TH seeded next succession of salad mix & the rest of the crew planted parsley in corner garden. (5/9) Lots of planting today. Five rows of flowers in flower field: marigolds, bells, strawberry fields, safflower and zinnias. Veg C also planted with 2 beds of kale, 3 chard and 1 cabbage/fennel. (5/14) More planting in Veg C south: kale, red & yellow beet transplants. Also added 4 more rows of flowers in flower field. (5/16) Big day for tomato planting! TH demonstrated planting of tomatoes in cow pots. From east to west in Ralphs house: black cherry, sungold, striped german at 18” for spacing. (5/20) Next succession of salad planted, as well as 2 more beds of carrots. (5/27) Full crew tomato planting (5 beds) using favorable furrow method in field. Lots of clumping called for 4 passes through each furrow. Clumps cleared out by hand and left on edge of furrow to be chopped by tiller. TH spread fertilizer and rototilled to incorporate fertilizer. (5/30) First years seeded one bed of carrots each, all steps from composting, to raking, seeding with the single row seeder and rolling. TH & MR showed and explained specific techniques. 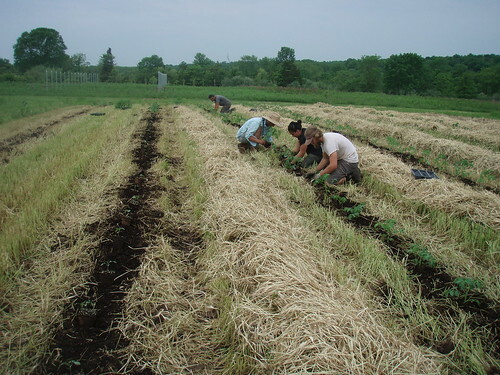 Crop Care (150.5 hrs): Maintenance and cultivation throughout the month including hand weeding, scuffle hoeing and wheel hoeing in all areas of the farm including BGBs, greenhouses, corner garden and field beds. (5/2) First scuffle hoeing of BGB SE. Some toscano kale replaced due to frost damage. Weeded NW fruit trees in market garden. (5/6) Weeds pulled from perennial flowers and strawberries in the 579 field. Beets, kale, cabbage, broccoli in Veg C scuffle hoed, and garlic cultivated with the wheel hoe. (5/14) Drip tape laid on beds in Veg C. Not a whole lot of rain this month so keeping up with irrigation was a constant. Harvesting (305.5 hrs): (5/2) MR gives harvesting intro to JT, RM & AM including the importance of a sharp knife, clean crate and personal hygiene. Harvested mizuna, arugula, kale, tat-soi and radishes form Ralph’s house, as well as scallions that overwintered in CSR field. (5/14) First field harvest of happy greens from BGBs! Harvested radishes from kale bed, an example of ‘intercropping’. (5/26) Tomatoes cleared out of hoop house. Harvested 8 small tables of stinging nettle. Handling (89.5 hrs): (5/1) Major purge and sanitation of Walk-in cooler and wash area. Weekly handling of crops harvested for markets. (5/16) JT on handling salad mix (62#) for weekend market. MR trained JT on proper handling and bagging techniques to minimize damage to fragile leaves. (5/20) Post-harvest handling workshop in Trenton; JT, AM & RM attended. (5/21) Crew discussions in the am regarding the webinar and how it fits into NSF operations: what is done well, what can be improved, etc. MR showed slide show introduction to the basic steps of handling at NSF to promote veggie freshness and safety. Marketing (136 hrs): (5/2) 1st wholesale seedling order to WEC. (5/3) First West Windsor Farm Market. Greens were smaller than last years, though only seeded 5 days later. Colder temperatures leading up to the first harvest may have played a role in this. (5/23) Beautiful day for Summit market. Beat sales of previous year by nearly $300!) (5/28) Received inquiry from Cherry Grove Farm for Stinging Nettle for their annual cheese). Special Projects (6.5 hrs): (5/3) Willow trunks planted near new high tunnel in hopes of establishing a windbreak. (5/5) MR calls Soil Conservation District to inquire about approval requirements for setting up a high tunnel. Two tunnels at 30×96 = 2,880 sq. ft each will fulfill their requirements. (5/19) MR met with soil conservationist to get NRCS perspective on building greenhouses in the central west field. Was told that the 2 pending will be approved and that the total potential will be based on existing waterways. TH harvested 6.5 lbs. of bamboo shoots from patch near seeding shed; approx. one hour of work in the rain. Bamboo shoots sold at market for $4 a pound! (5/22) TH harvests Lambs quarters bunches for sale. (5/6) After string checking the level of the high tunnel ground posts it was discovered that the 3 NW posts need to be excavated and reset. Week 1: Heavy rains leading into the first day of May. First week sunny with temperatures in the 40s and low 50s. Warming and drying by the end of the week. Week 2: Mix of sunny and overcast days, temperatures in the low 50s. Gusty breeze from the South East toward the end of the week. Week 3: Starts off sunny with temperatures in the mid-40s. Still quite chilly at night. Rainy end to the week; 2” on Thursday and 1/2’” on Friday. Week 4: Week starts off hot; 85 degrees on Monday! Tuesday showers with thunderstorms in the forecast. Most of the week remains overcast and mild in the mid-70s. Sunny weather returns on Friday.